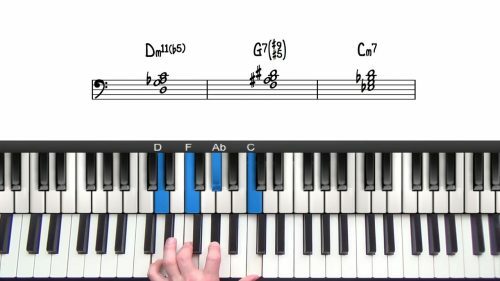 In this lesson, we’re going to look at the jazz standard ‘The Shadow Of Your Smile’. 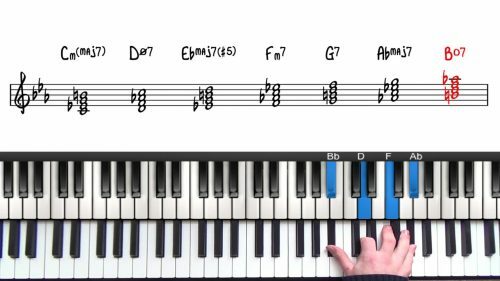 The tune is usually played in G Major which is the version we are working from, but you will find versions of the song in other keys. The tune follows a 32 measure AB form and has quite a repetitive melody with similar melodic phrasing used throughout. ‘The Shadow Of Your Smile’ is also often played as a bossa but in this lesson, we are going to play it as a ballad to learn the chords and changes. In a future lesson, we will then revisit the tune and add a bossa nova rhythm. We’re going to start off with some 2 handed voicings and play through the form exactly as it’s written. Then the second time through, we will add some passing chords and suspended harmony to add more interest and movement to the chord changes. This tune can be played as a ballad, at a medium tempo, and also with a bossa nova feel. Listen to many different recordings to get a flavour for how this tune is commonly interpreted.